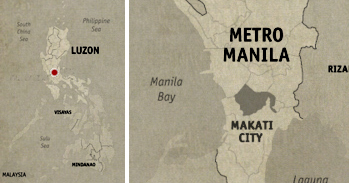 METRO MANILA | Let’s Eat sa Kabila! Two slabs of mouthwatering deep fried pork bagnet greeted us as we moved from our breakfast table at M Café, to its north wing—which was really just ten steps away from us—where lunch awaited us. Aptly dubbed, Kabila, this is where we’re gonna have our next meal. Yes, we’re insatiable like that. 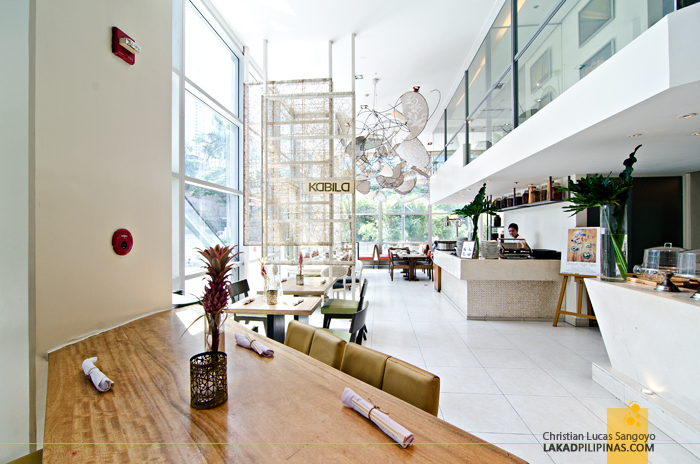 Located on the ground floor of the famed Ayala Museum, a building designed by none other than National Artist for Architecture, Leandro V. Locsin, M Café and Kabila Filipino Bistro shares a very modern interior set in all white. The whole floor is decorated by various paintings, mobiles and sculptures. Although I haven’t been inside the museum itself, I guess it somehow reflect the artsy nature of the place. 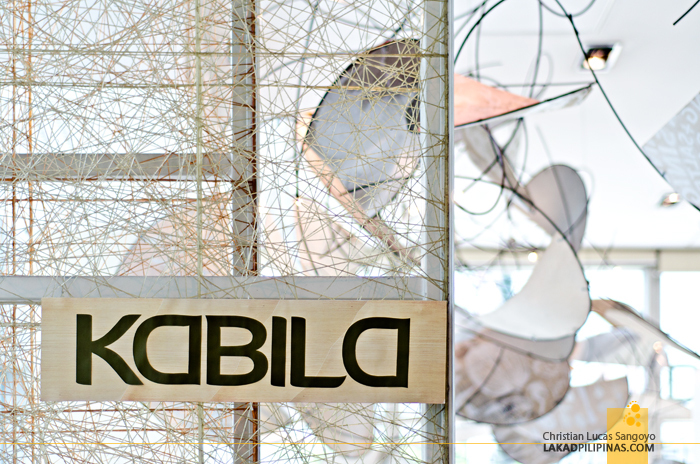 Kabila offers mostly Filipino dishes served in a not-so-ordinary way. 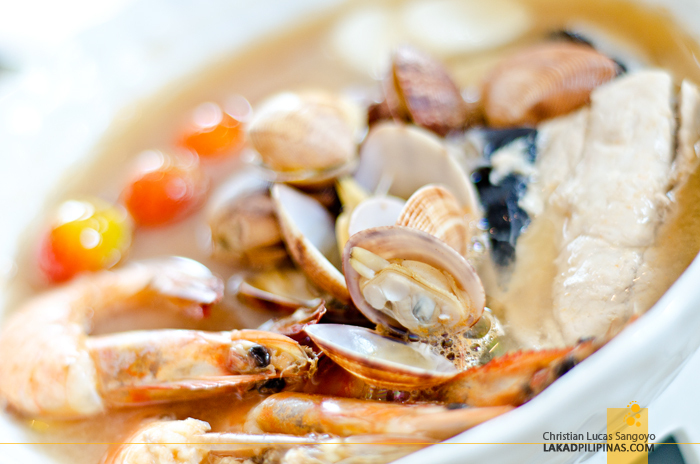 In the next hour, we were expecting to be treated with classic Pinoy staples with a twist. I’m thinking this bistro is somehow similar to Simple Lang—one of its sister restaurant—but geared towards a much more mature dining audience. For starters, plates of Ensaladang Kabila and Fresh Lumpia sa Kabila made the rounds on our table. 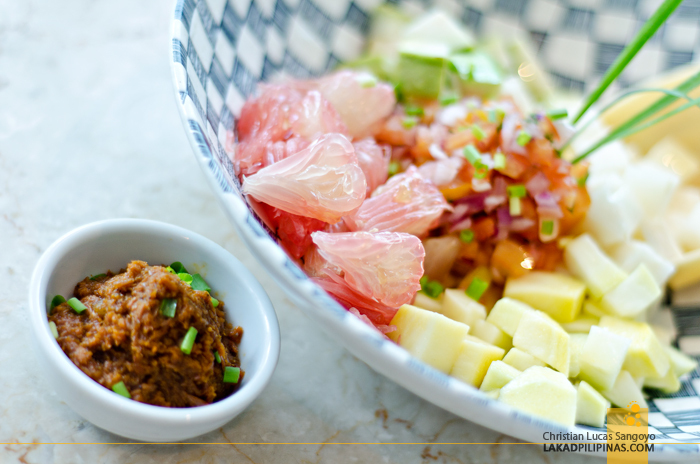 The ensalada, which curiously has salted egg, pomelo, guaple and turnip aside from the usual diced mango, tomatoes and onions, was a hit, mostly due to its bagoong which has just the right amount of sweetness. 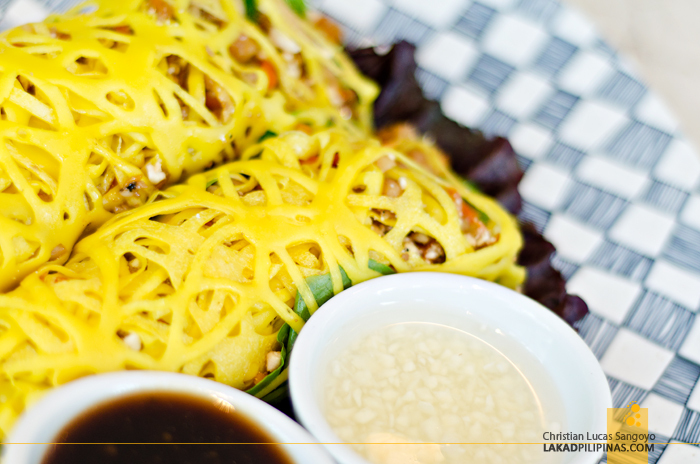 The lumpia, on the other hand, with its avant garde mesh-like wrap, was a bigger hit. It was unanimously declared a winner by most of my friends. Filled with shrimp, ubud, ground beef and paired with vinegar and sweet garlic dips; it definitely taste very much like home. For the main event, we were presented with Seafood Guava Sinigang, BBQ Chicken Inasal, Slow-Grilled Gindara and Kabila’s Pork Bagnet. Their sinigang, which uses native bayabas base, was just okay for me. It might be that I just have an aversion for soups with fishes swimming on them, or I just really prefer the classic tamarind-based sinigang. 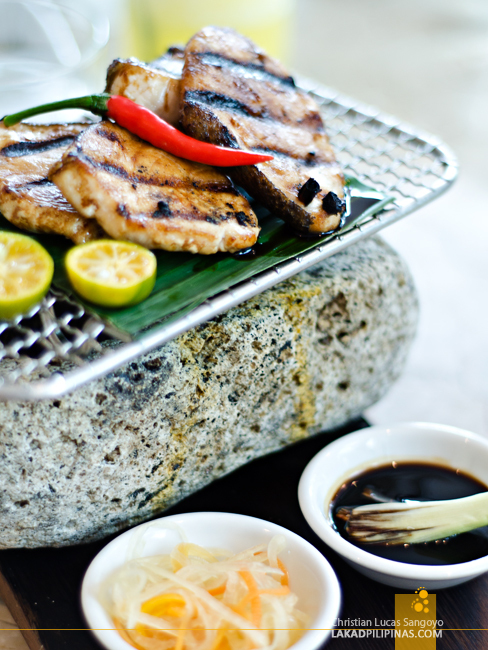 The grilled pork and fish, which wowed everyone with its creatively plated set, were as flavorful as they were beautiful. 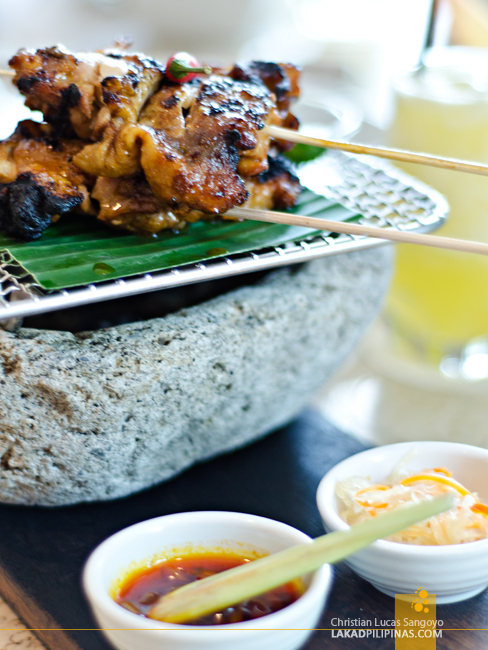 Both vanished from their mini-grills the moment our camera shutters stopped clicking. I managed to get a stick before it totally disappeared. Very smoky and tasty! 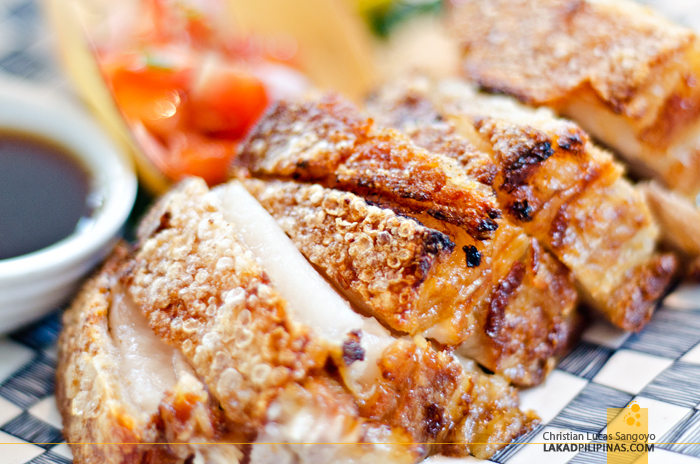 But the star of the show for me was their bagnet. 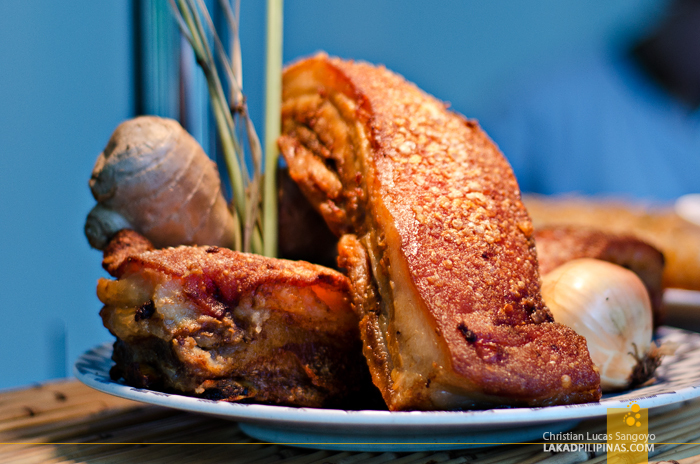 A popular Ilocano dish, Kabila’s version of this multiple-fried pork slab seemed quite classical in such a way that I can’t seem to find anything unusual with it compared to its traditional counterpart. Well, if you really can’t beat the original, why deviate from it. As expected, the pork skin is ultra crunchy and the meat very tender. Like most bagnet, it’s a bit bland on its own, however, after I put in a bit of the KBL (kamatis, bagoong, lasona) dip, I started to enjoy it like how I enjoyed the original ones I’ve had in Ilocos. For desserts, a chopping board of rolls filled with leche flan, a chocolate dip made from Choc-Nut and an actual Choc-Nut(!) was slid onto our table. 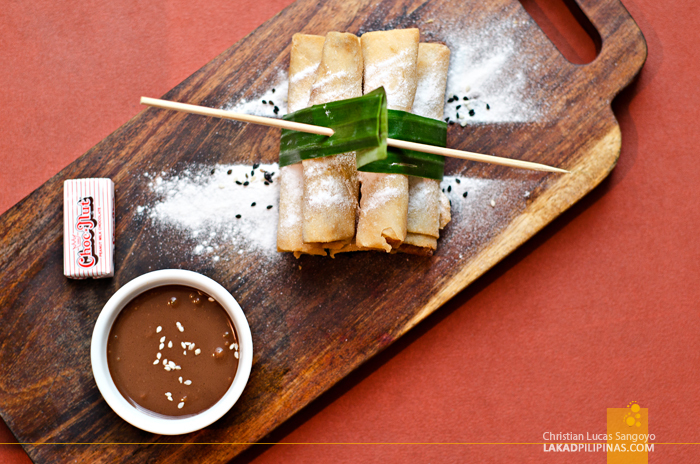 This is Kabila’s version of the ubiquitous Filipino afternoon snack, turon. The lone Choc-Nut itself was enough to put an exclamation point to our meal, but add the turon, and it was really just the perfect Filipino dessert to cap off our lunch. 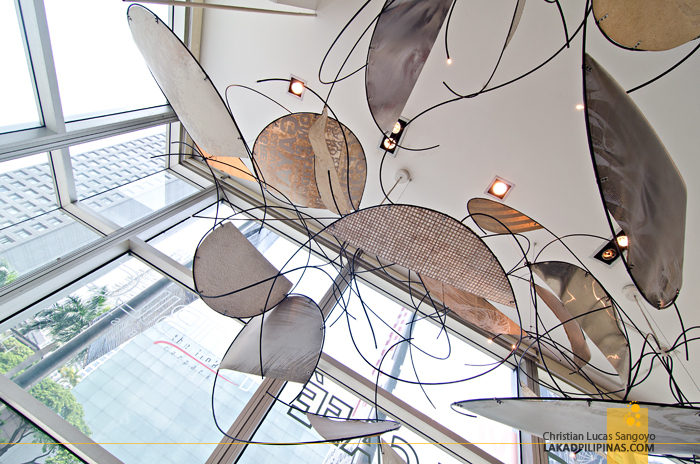 Address: Ayala Museum Complex, Makati Ave. cor. W O W Chocnut dip!